The company’s products were rapidly accepted by the national market and today “Hand Brand No.1” is a household name in Thailand in terms of 100% pure spices and herbs. to operate under the auspices of the Nguan Soon Group and to control the expansion of the company’s overseas trade into markets. 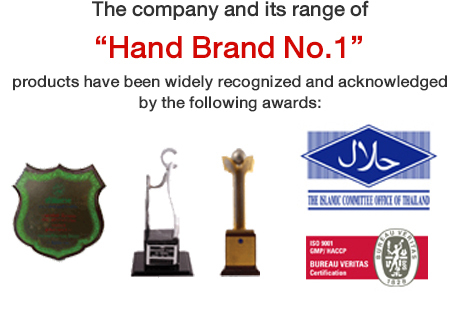 The company’s policy to produce premium quality products supported by excellent service lead to the exportation of the “Hand Brand No.1” product range to more than 20 countries around the world. Today, the company sources only the highest quality raw spices and herbs and uses the most modern dry-heating and crushing technology to process them. The technology used for the production and packaging process is regularly upgraded to ensure the preservation of the freshness, original aroma, flavor and nutritional value of the wide range of spices and herbs produced, sold and distributed by the company. Quality control is another keystone of the company’s success. The company follows a policy of strict quality control producers to ensure the maintenance of the highest standards of hygiene throughout the production process. The Standard Mark form the Thai Ministry of Industry for ground white pepper “Hand Brand No.1” Standard Mark No.297-2529. The Spanish International Trophy for Quality. 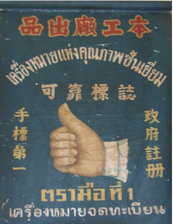 1988 The Thai Best Exporter Award for agricultural industrial product. Thai Ministry of Public Health Award for the best pepper product. The Shell Guide Test Guarantee for the best pepper in Thailand. ISO 9002 certification for white pepper power “Hand Brand No.1” received by Artchit International Pepper and Spice Co,.Ltd. Certified seal of GMP for pepper and spice under hand brand no. 1 brand and HACCP certified for white pepper powder under hand brand no. 1 also. Certified Quality Management System ISO 9001: 2008. Prime Minister’s Export Award 2011 by the Ministry of Commerce, Royal Thai Government as the highest official tribute to the country's foremost exporters. Besides the prizes and awards we have received, we are very proud of the acceptance and trust placed in our products, packaging and pricing by consumers, restaurateurs, supermarkets and the food industry, both internationally and domestically. In recognition of the confidence in us by our customers we continue striving to achieve even higher standards for our products and services.